Lol! My husband isn't thrilled with any of it, he just stays out of the laundry/bug room. Sounds about like my wife lol. She hates the crickets and roaches but is as fascinated with my isopods as I am. So I try to keep her concentrated on isos and their new broods of babies lol. My wife-"How many crickets are you getting?" My wife after seeing the receipt in our email-"500 is not a few!" "What if the lizards don't like them?" Me-"I've never known a bluegill to turn down a cricket." My wife-"If any of them get out,you're eating them!" Me-"I'm always up for new cuisine." Nothing but dirty looks the rest of the night lol. I don't mean to bump this thread but just wanted to say that i placed an order from rainbowmealworms Friday morning and got my package yesterday morning.. I don't think i've ever experienced such fast service from Cali to FL.. like ever. Everything was labeled, everything was tightly secured. I will absolutely buy from them again. Thank you to those who referred me to them! I will of course try the other sites as well but definitely wanted to give props to rainbow! Interesting that you got them delivered on a Sunday. Which delivery service was used? That is awesome. Typically they only mail out priority USPS on Monday-Wednesday. I always have mine mailed on Wednesday and get it on Friday. I am in Cali though. I like their selection and prices. I have never had an issue with any of my orders or bugs from them. Cool, did they send it express or priority then? yea, they must have done it priority but i can't be too sure and the box is still at home. as soon as i got it, i ripped it open cause i wanted to see all the bugs! Josh frogs is also great!! And honestly you can also get most things on amazon! I will definitely try them out, thank you! i use joshs frogs as well. went to visit Josh's site and the first thing that pops out is that they sell bird poop frogs LOL. i love it! I will also recommend before you getting the feeders.try set up a clean glass tank for them ...thing like egg crates...tubes...even a heat lamp. Clean sources of water is also very important. 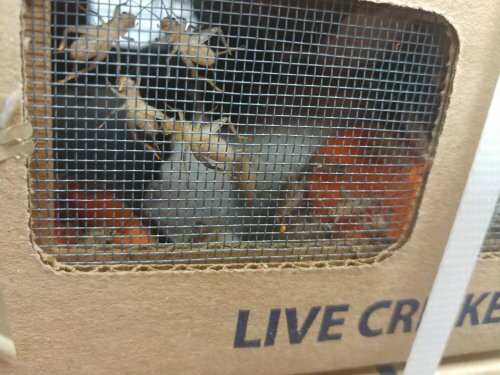 So question I’m still waiting on acceptance or something for my roaches but as for food, I’ve read they like oranges it’s good for food and water, but I also read they eat cricket diet powder too? What type of cricket poweder?? 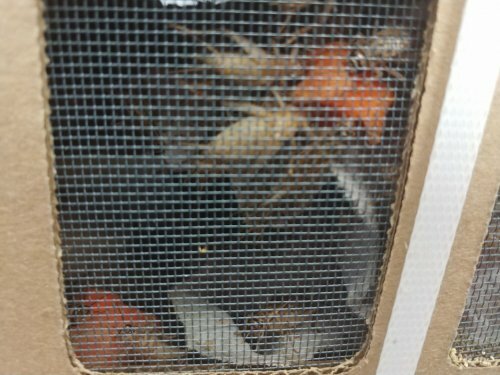 The roach seller usually include a piece of orange during the shipment to your house so the roaches can use it temporary. Iceberg lettuce and avocados should be avoided completely! And if u can,get the organic one ,it will be even better. Above is my own WET gutload.Here are the old school from the sandrachameleon's blog for the dry gutload.